The Marvellous Days Out artwork is on tour as an Art Exhibition featuring 14 framed A1 prints on easels. From Friday 29th March 2019 until Wednesday 10th July 2019, you can visit the exhibition on Platform 3 at Stockport Railway Station. The tour started at Lion Salt Works, moved to Stockport Plaza then Art With A Heart in Altrincham and most recently it has been on display at the Knutsford Heritage Centre and in the Tower Gallery, North West Media Centre, University of Chester, Warrington and the Northwich Customer Service Centre. The artwork was then at the Crewe Heritage Centre, the Manchester Transport Museum in Cheetham Hill and the Northwich Plaza. 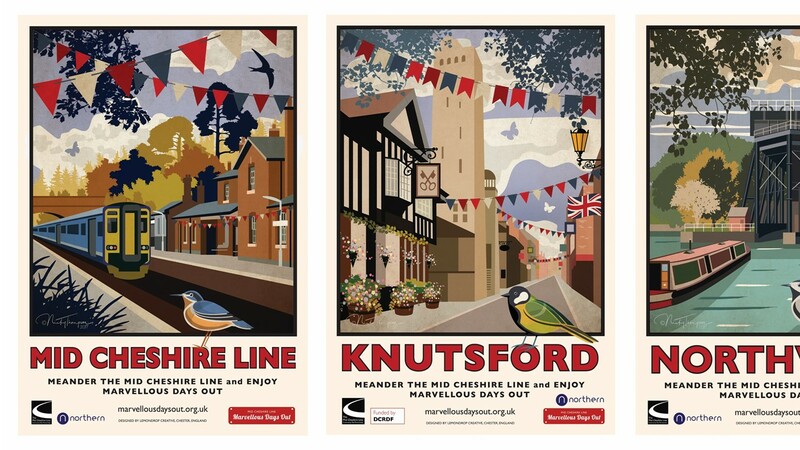 Wherever the artwork is on display, it is attracting visitors and interest and is encouraging people to take the train and have a marvellous day out visiting local attractions. The exhibition is available free of charge for locations across Cheshire and Greater Manchester, please get in touch for further details on how to book it.